Product prices and availability are accurate as of 2019-04-19 04:55:12 UTC and are subject to change. Any price and availability information displayed on http://www.amazon.com/ at the time of purchase will apply to the purchase of this product. Accidents on the stairs can be very dangerous. Reduce the risks with this set of 10 Kenley Stair Treads. Designed with families in mind, these Kenley stair treads are comfortable to walk on in bare feet. 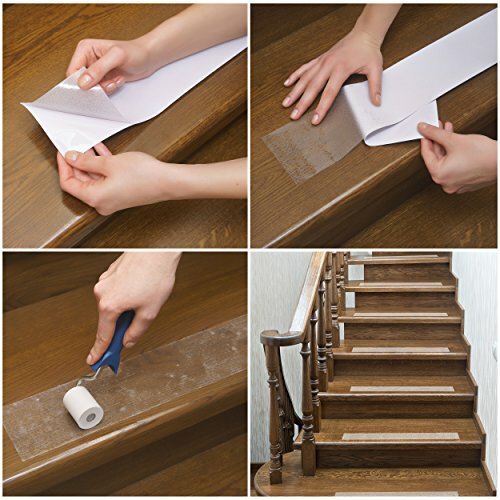 The tape doesn't contain any grit or abrasive and is free from chlorine, PVC and other hazardous chemicals, making it ideal if you've got babies or pets who need sure footing on the stairs. 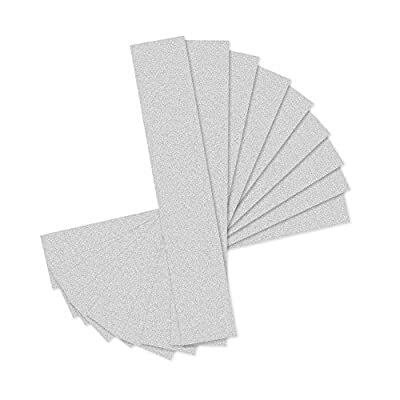 Each pack contains 10 individually cut 24x4in (61x10cm) transparent strips with rounded corners. They are suitable for use with most smooth flooring types, such as tile, wood, stone (granite, marble and limestone), smooth concrete and metal. Designed for indoor and outdoor use, this stair tread tape is suitable for use in domestic and commercial properties. Being transparent, the stair treads can be discreetly installed wherever you need them without ruining the look of a room or staircase. The tape is water, oil and detergent resistant so can be used in bathrooms and on boats. It can also be mopped or swept as you clean your stairs normally. Installation takes just a few seconds as the tape is fully self-adhesive. Kenley stair treads should only be installed on clean, dry surfaces. They are designed to be a permanent solution and to stick down fully and thoroughly so can be difficult to remove should they no longer be needed. MAKE STAIRS NON-SLIP The unique textured surface on these Kenley non-skid stair treads helps prevent slips, trips and falls. This is ideal if you have family (including children and elderly), pets or guests who are at risk of a stumble or fall. REDUCE ACCIDENTS INDOORS OR OUT Accidents on the stairs can be serious: reduce your risk today. 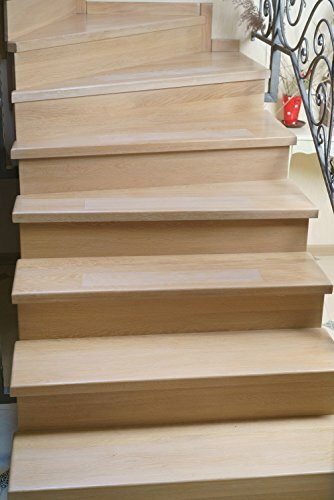 Suitable for use on wood, marble, tile and other stairs, these Kenley stair treads can be used indoors or out. They must be installed on clean, dry stairs and should be checked regularly. TRANSPARENT AND COMFORTABLE At 24x4in (61x10cm) these Kenley stair treads are large enough to be effective yet don't damage the look of your stairs. As this stair tape is transparent, it's hard to spot once installed. The rounded corners reduce the risk of fraying or turn ups. It's comfortable to walk on in bare feet. EASY AND QUICK TO INSTALL Fully self-adhesive, this Kenley stair tape takes just seconds to install. 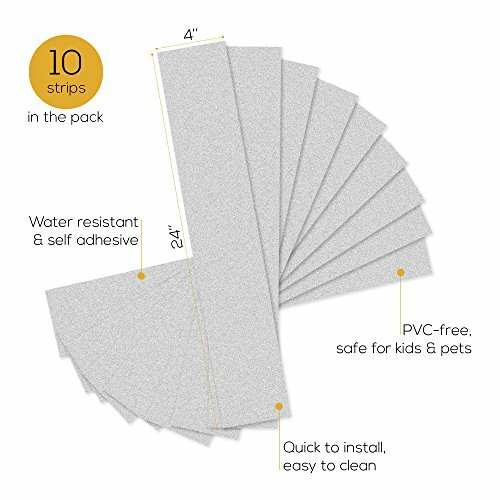 Each pack includes 10 strips and can be used on staircases, showers, floors, ladders and decks. It's water, detergent and oil resistant and can be cleaned with the rest of the staircase in your usual way. 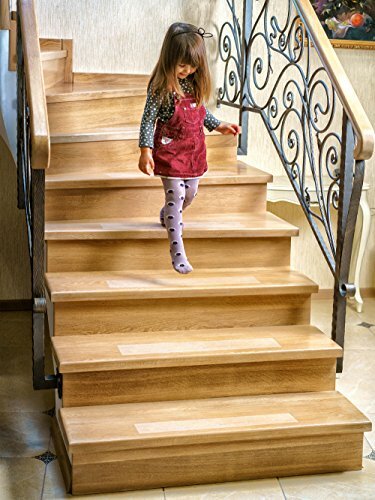 SAFE FOR KIDS AND PETS Soft on the feet, these Kenley stair treads don't contain any grit or abrasives. Made from environmentally friendly materials, these treads are free from chlorine, PVC and other harmful chemicals so you don't need to worry about babies, toddlers or pets using them.